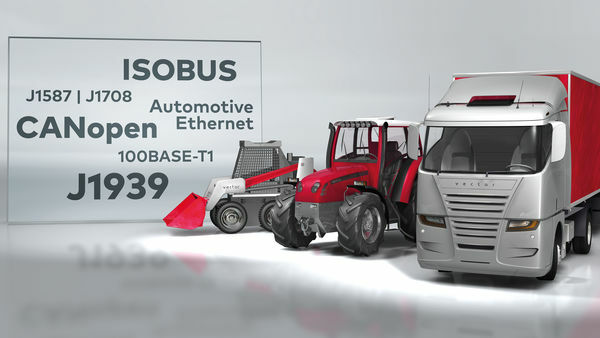 SAE J1939 is the open standard for networking and communication in the commercial vehicle sector. The focal point of the application is the networking of the power train. Characteristic for SAE J1939 is the use of CAN technology for networking and communication as well as manufacturer-spanning interoperability. The J1939 protocol comes from the Society of Automotive Engineers (SAE) and works on the physical layer with CAN-highspeed according to ISO11898. Standardized CAN baud rates of 250 kbits/s and 500 kbits/s. The SAE J1939 protocol uses CAN (Controller Area Network, ISO 11998-1 and ISO 11998-2) as the physical layer. The CAN protocol plays a major role in motor vehicle networking and represents a commonly used method for bit serial communication between electronic control units (ECUs). Typical ECUs include: Engine, transmission, and brake ECUs as well as the instrument panel and door ECUs. There are a number of standards which are derived from SAE J1939. These standards use the basic description of J1939 and often differ only in their data definition and adaptations of the physical layer, where necessary. Defines the communication in vehicles used for agriculture. Specifically, the communication between the tractor and add-on equipment, the so-called implement. The ISO 11783 standard specifies services at the application layer, for example, the control of add-on equipment via a Virtual Terminal. The add-on equipment itself brings along all graphic elements needed for its control, which the Virtual Terminal can display. Other application components are: Tractor ECU, Task Controller, File Server, and Sequence Control. The ISO 11783 standard has an extension of the multi-packet protocol defined for SAE J1939. The Working Set mechanism is also applied. Defines the ECU communication between vehicles in the maritime environment. An extension of the multi-packet protocol – the so-called Fast Packet protocol – is also used here. Specifies the message exchange of road vehicles between the towing vehicle and the towed vehicle. ISO 11992 is based on the message format of J1939 but uses a different configuration of the physical layer, namely only 125 kbits/s. The FMS standard defines a gateway between a J1939 network and the FMS. The complete J1939 specification is subdivided into various documents and chapters. All documents can be downloaded individually or in preassembled packages from the SAE website: www.sae.org. There is a charge for the individual chapters of the J1939 specification, i.e., they cannot be accessed for free. The individual chapters are structured systematically and are loosely based on the ISO/OSI reference model. Loosely based only, because the document structure of J1939 contains a chapter 8, which is not defined in the OSI model. The table on the right lists the currently existing chapters and documents. The J1939-21 document defines the scheme according to which the 29-bit CAN identifier must be interpreted. Similarly as for the 8-byte data field of a CAN message in which different signals are defined by a start bit and length, the CAN identifier is subdivided into different segments for a parameter group. By this only a part of the identifier represents the PGN itself, the rest is interpreted as source address, destination address, priority, and data page (DP). The two bits “Data Page” (DP) and “Extended Data Page” (EDP) are also part of the PGN and are included for counting as the two most significant bits. As a result, the numeric range is arranged in four PGN pages, but only 3 are used for J1939. Messages greater than 8 bytes in length are too large to fit into a single CAN Data Frame. Therefor they must be divided by the sender into individual packets, which can then be sent with a CAN message each. The receiver has to recombine the individual fragments in their original order. A set of rules is defined for this in the J1939 standard: a so-called transport protocol. Two transport protocols are defined corresponding to the communication types. With this protocol the sender establishes a connection to the receiver. The receiver has the option of controlling and influencing the flow control of the individual data packets. Both the receiver and sender can abort the connection (e.g. in case of errors). The Connection Mode Data Transfer protocol is not subject to any time limitation. All nodes potentially exchange their data with one another at their maximum possible speed. The sender alone manages the flow control. The message is always sent to all nodes. A receiver cannot intervene in the communication. If the receiver misses a message, it cannot signal this. The receiver must wait for a new message, if necessary. Because the receiver is not able to influence the flow control in the BAM protocol, the sender must maintain a minimum interval between the individual packets. This is 50-200 ms. This allows possible slow network nodes to follow the communication. The J1939 diagnostic interface defines a standard diagnostic connector as well as a set of PGNs for handling different diagnostic services. The PGNs designated as a Diagnostic Message (DM) largely fulfill the scope of functions of the UDS diagnostics (Unified Diagnostic Service). They also comply with the EU Directives and with the “California Code of Regulation” for Onboard Diagnostics (OBD II), as well as HD OBD (Heavy Duty OBD) and WWH (World Wide Harmonized) OBD (ISO 27145). In contrast to the UDS diagnostics in which services have to be actively initiated via a software tool, J1939 ECUs also send diagnostic messages independently during standard operation. Errors that occur are evaluated directly in the network and visually displayed, if necessary. In parallel with that, errors can be read out with a tool via the diagnostic connector. Uniform error codes – so-called Diagnostic Trouble Codes (DTC) – contain the faulty SPN, the error pattern, and the frequency of occurrence of an error. Represents the SPN with error. Every defined SPN can be used in a DTC. Represents the nature and type of error that occurred, e.g., value range violation (high or low), sensor short-circuits, incorrect update rate, calibration error. A counter that counts the occurrence of the error condition for each SPN and stores this even when the error is no longer active. Defines the byte alignment within the DTC. The value “0” represents the method shown in graphic “Structure of a DTC”. If CM has the value “1”, a distinction must be made between three previously valid methods; this must be known for the system. Vector is a member of SAE J1939 committees and participates regularly in the workshops. Thanks to Vector's expertise and many years' experience in the J1939 environment, you profit from high-performance products and services with which you can solve your challenging problems more efficiently, faster, and more cost-effectively.